When I was younger, my Dad used to make my brother and I the most delicious Chicken Enchiladas with Green Chili. 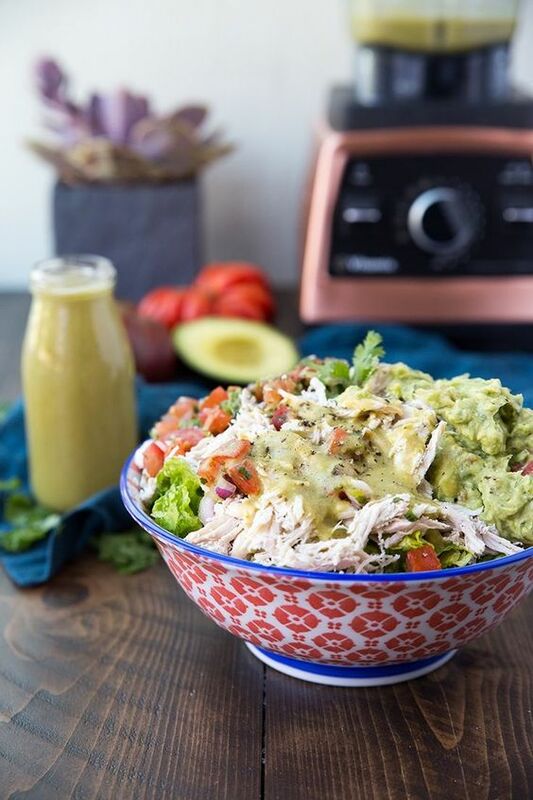 Since Father’s Day is just around the corner, I decided to pay homage to my Dad and create this delicious paleo & Whole30 compliant Green Chili Salad with Shredded Chicken. Topped with my Classic Guacamole, Pico De Gallo and Paleo Green Chili, this salad is perfect for a summer night or an excellent meal to pack ahead. For the Green Chili Sauce, I use my absolute favorite appliance, my new copper Vitamix. A lot of Green Chili sauces are thick and chunky, plus they often use flour as a thickener. This sauce is nice and creamy and it gets it’s perfect texture from the blended peppers and gut-healthy broth. I am on Day 15 of my June Whole30 and going strong! I can’t wait to share my experience, tips and maybe even host a giveaway with some of my favorite Whole30 products, so stay tuned! Prepare Paleo Green Chili Sauce and allow to cool in the fridge. Add two chicken breasts to a small pot and cover with chicken broth plus a splash of your green chili. Bring to a boil and then cover and simmer for 45 minutes. While the chicken is cooking, prepare the guacamole and pico de gallo and set aside. When the chicken is done, strain it and shred it with two forks. 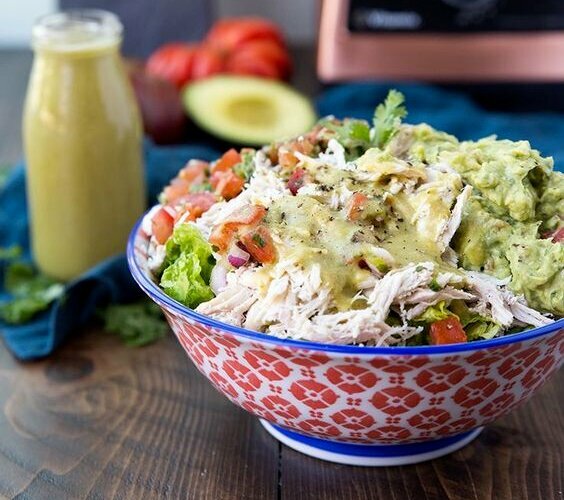 Add romaine to two bowls and top with the shredded chicken, pico de gallo, guacamole and dressed with the green chile sauce! Disclosure: I received a Vitamix Pro 750 from Vitamix as compensation for this post. Vitamix did not influence my opinion of this or any other product. All views and opinions expressed in the post are my own and no other compensation was provided. Yeah, it’s definitely easy to get stuck in a rut. Experimenting in the kitchen is so fun! !